Even though in-store retail transactions for Apple Pay are only available for two handsets and rolled out in the past two months, Apple’s digital wallet is building momentum quickly. The company told the New York Times that its Apple Pay service now works with bank cards accounting for 90 percent of all transactions by purchase volume in the U.S. as dozens more payment cards now work with the service. To be clear: That doesn’t mean [company]Apple[/company] Pay is used for 9 out of 10 purchases. Instead, Apple Pay supports the cards that account for 9 of every 10 dollars spent. However, it shows a building of support and potential use that earlier competing digital wallet products — [company]Google[/company] Wallet and Softcard come to mind — still don’t enjoy. While Apple’s latest figure doesn’t provide metrics on overall purchase volume using Apple Pay, some retailer-specific data does, according to the Times. Whole Foods processed 150,000 Apple Pay transactions in the first few weeks of availability, for example. And fifty percent of all tap-to-pay transactions at McDonald’s are now completed through Apple Pay. I’ve used Google Wallet with NFC and an American Express card with RFID chip for McDonald’s tap-to-pay since 2011, so the retailer is no stranger to this transaction type. It’s not surprising to me that Apple Pay already accounts for half of these digital payments there because so few people realized that McDonald’s could have accepted them for so long. And that’s really where Apple Pay is differing from prior digital wallet solutions in the U.S., because let’s face it: Although there are some key implementation differences, Apple Pay uses NFC to replace the credit card swipe, just as other similar solutions do. It’s all about the marketing, both from Apple and the companies that accept Apple Pay. Put another way and continuing the McDonald’s theme: My local fast-food joint didn’t need to add NFC terminals to its location because they’ve been there for years. Nobody knew they could use them. Now, an Apple Pay sign on the door, along with excellent new phones that have an NFC chip and supporting, is bringing in the digital dollars. We are somewhat tired of the lag in Apple services being rolled out here. It is especially tiresome when they roll them out in France or the UK or even Australia before Canada. If Google wallet was equally good then why did people not use it? Fact is Apple makes products that are easy to use, unlike the convoluted mess that is Google & android. 1. Carriers fought against it and even blocked it. 2. Those people who had a phone capable of using Google Wallet didn’t know about it. 3. Retailers didn’t help market it. I didn’t say the services were identical; in the article I specifically said they had different implementations. Also, Google Wallet can read the card through a camera as well, so that’s completely invalid. PIN vs. Touch ID = different implementation of security. I’ve tried on a Galaxy S4 and it always no matter how I hold the camera only gets parts of the card and I end up having to fill in the rest. 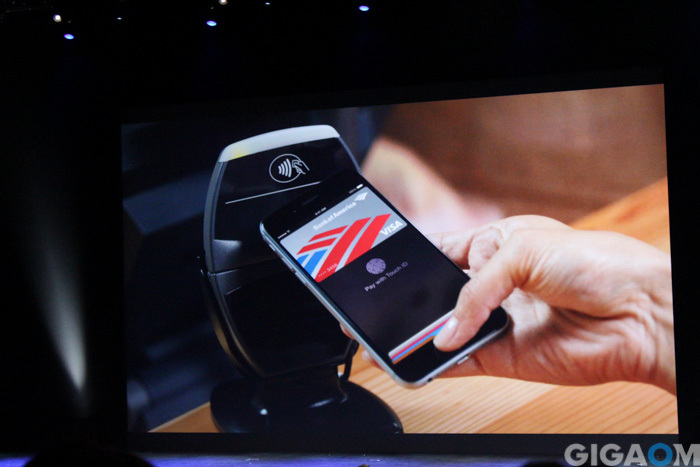 In essence Apple Pay is easier to work with than Google Wallet. Obviously if you are building for one device that’s to be expected that Apple Pay would be more polished. So not only did Apple have better marketing than Google again IMO Apple has the better system. Any retailer that accepts Apple Pay will also accept Google Wallet. I don’t think banks have to “accept” Google Wallet since all you have to do is add your credit/debit card through the app or website. I personally have Visa, Master Card, and AMEX all on my account. They all been working fine since I first added them back in 2011. That headline is a lie using correct numbers. I believe what Apple said is that cards supporting Apple Pay constitute 90% of the bank-card payment ecosystem. Meaning 90% of transactions are theoretically capable of using Apple Pay (if merchant and purchaser were both set up and using compatible hardware). Which is a distinctly different claim. Not according to the Times, which is who reported what Apple said. Google Wallet has already been around for three years or so. Google was slacking for three long years wasting time with relatively useless projects. You’ve got critics saying Apple Pay isn’t moving along fast enough but no one says boo about how slow Google Wallet usage growth was. Now Google Wallet can simply ride along with Apple Pay without Google lifting a finger. With Google constantly boasting about all its smartphone market share and fully-equipped NFC devices, Google Wallet should have taken over the world of mobile payments by now. Braggart Eric Schmidt will continue to say that Google Wallet is just as good if not better than Apple Pay. They should have been able to prove that boast a long time ago. Apple only has two paltry NFC devices introduced just a short while ago and yet Apple is making more progress in just a couple of months than Google Wallet has done in a couple of years. Go figure that from the almighty market share Google. They’ll continue to boast about how they were the first and Apple is just a johnny-come-lately. Not in Europe out yet…hope it gets soon here! It is probably true that more people use Apple Pay than Google wallet, But, correct me if I am wrong, Google Wallet also works at every retailer that accepts Apple Pay. And I think Google Wallet accepts credit cards from ALL banks (at least MasterCard and Visa), including credit cards from credit unions, as well as debit cards. You’re mostly correct. I’ve seen Google Wallet actually disabled or turned off at places where Apple Pay is now accepted. Doesn’t make sense to me from a retailer point of view to do that but…..
Google Wallet is a totally different solution. I pretty sure CREDIT cards are not involved, only ACH bank acts and DEBIT cards, but I may be wrong. Google Wallet works with credit cards as well as debit cards. Google wallet has almost stopped working. The google wallet for digital goods is already dead. It seems like google is on a roll back on payments front.